Greetings and salutations, everyone; yes, once again it is I, your popular host, Mani the purebred border collie, here today to bring you yet another didactic post, as well as some news relating to our modern lifestyle. You may remember me from such posts as “Selling Insurance”, among so many, many others. 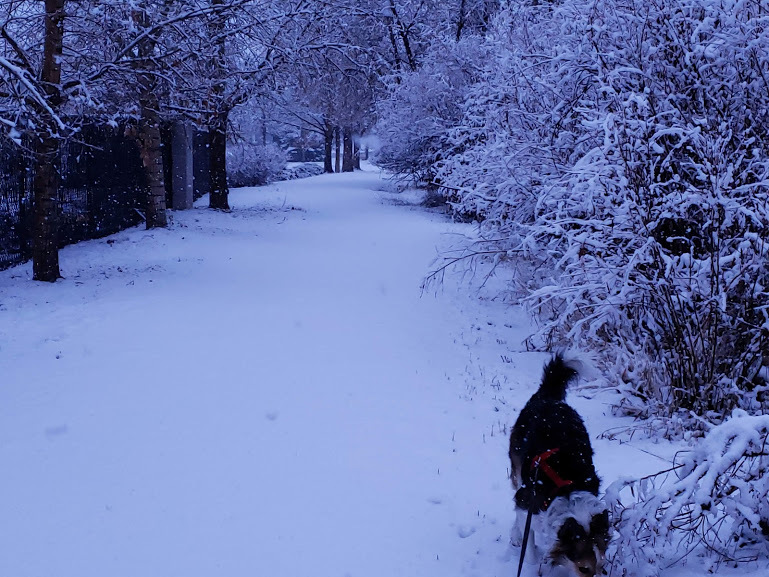 It wasn’t very cold out when my picture was taken, but the snow isn’t really melting as fast as the guy I live with would like. You should hear the complaining. He says that snow is like having a house guest who constantly talks about the same thing and outstays their welcome. “Quite unlike rain”, he said, gazing out the window, wistfully. I like snow, but the guy I live with has issues with me trying to “fly” when we go on walks in the snow. “Mind the leash”, he says. 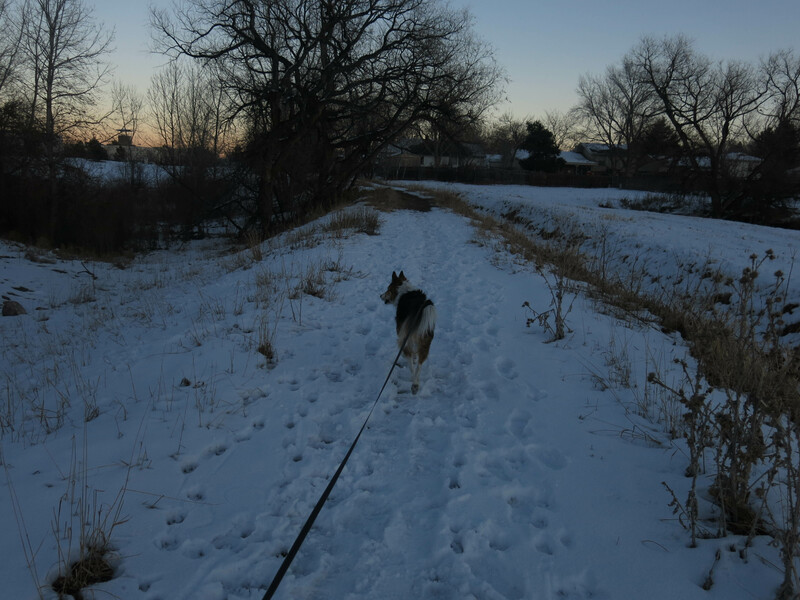 He’s old, and what with the hormone therapy, his bones are becoming brittle, and if he falls down, he might break something, and just lie there, while I’m racing around tugging on the end of the leash. I suppose that if that happened, I could drag him back home, though he’s pretty heavy. Since it snowed, things here have pretty much come to a standstill in the garden, and the guy I live with talks about how boring all of this is. Sometimes he just sits there, rocking back and forth a little. Or stares at the floor. I forgot to show this curious picture which was taken a few days ago. The guy I live with said those were marks made by the fiendish hands of Snow Demons trying to get to the surface. They kind of looked like they were made by bird wings, to me, but he said no, Snow Demons. We obviously have widely divergent opinions about snow. It turns out that what you do when it snows, when you’re not outside, is to do stuff inside, and when the boredom gets to be too much, you decide to do a thing that you meant to do a while ago but never got around to doing, even though you didn’t really want to do it , but it needed to be done, and then when you started in on it, you discovered things you didn’t want to discover, and had to work out a way to fix them, without using too much colorful language. The guy I live with re-caulked the bathtub. I watched. It was extremely boring to watch. When he got to one end of the bathtub, right down at the bottom outside corner, he discovered that water from the tub had gotten under the tiles on the floor, and the tiles just came up, so that had to be redone, which made the whole job even more disagreeable. 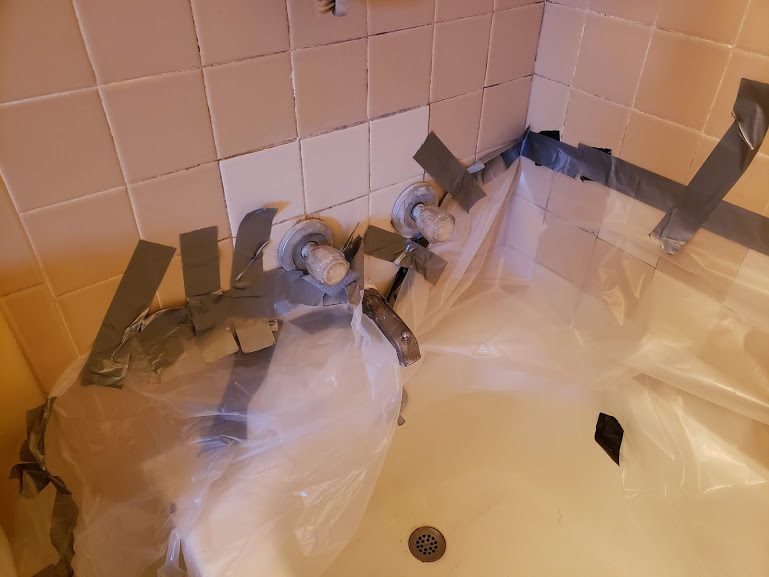 Once the tub had been re-caulked, plastic had to be taped around the tub so he could take a shower. Like me, the guy I live with is obsessed with cleanliness, and likes to bathe every day. This is what the tub looked like after the plastic was taped around the faucet end. I’m sure you’ll be impressed. It’s kind of like an episode of “The Red Green Show”. You can see that the grout around the tiles needs to be cleaned, too. Meanwhile, when the day came for me to go to Day Care and play with my friends, the guy I live with went out with his friend, and they went to a bookstore, where he found this book, which he’s going to give as a present. He looked through it and said the writing was really good like others from the same author. 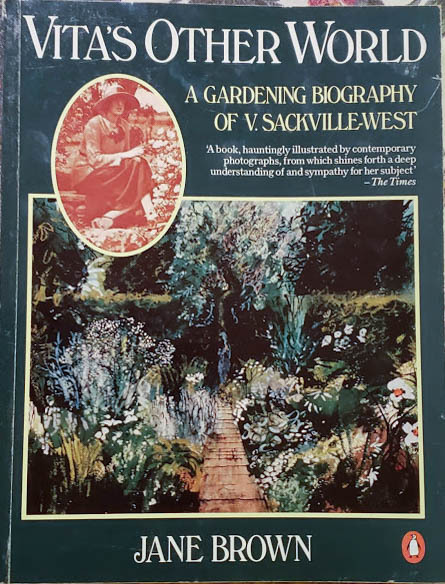 And that if you like things like this, English gardening, Sissinghurst, roses, a sort of romantic, wistful approach to gardening, then you might like, even love, this book. So here I am talking about gardening again. Of course I can’t talk about fog, or mist, or drizzle, or rain, at this time of year, when the garden here is covered with snow, hard crusty cold white stuff which the guy I live with is the horticultural equivalent of having to stare at a spot on the wall for three straight days and then write a paper about it and deliver it to an audience of people who think staring at spots on the wall is the most exciting thing ever, but I can talk about snowdrops. Yes, snowdrops again. There are none flowering in the garden, because of the snow, but there are some flowering upstairs, in what is technically the master bedroom but has never been used as such. It’s just the guy I live with’s room, and has been since he moved into the house with his wife, who had rooms downstairs. 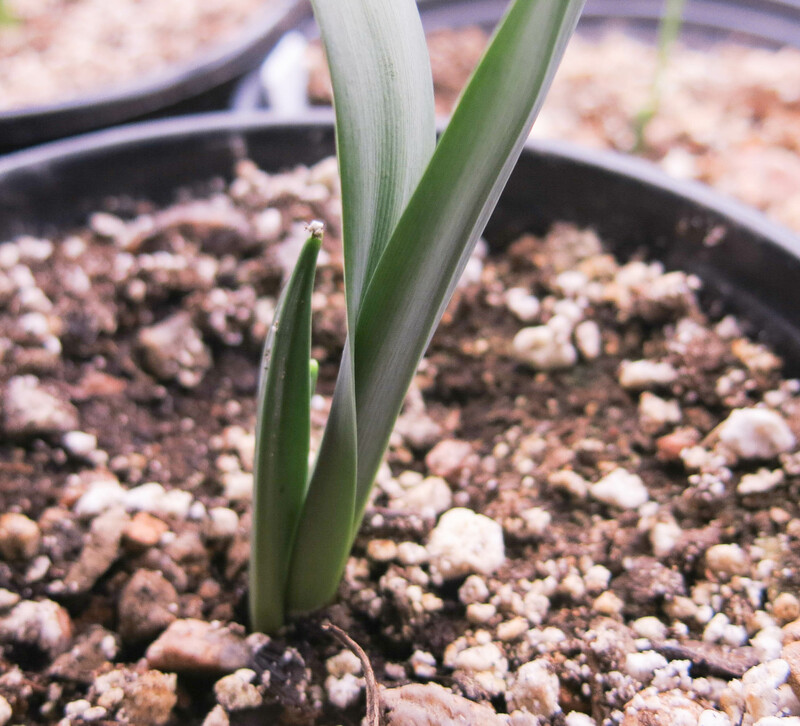 This is a double snowdrop, called ‘Ailwyn’. I see a sad face here. Since I’m under constant pressure to talk about snowdrops, because the guy I live with would rather be gardening than just sitting here wondering when the snow and cold was going to go away, which leads him to wondering why he lives in a place where such awful things happen, which brings him back to snowdrops, I thought I would talk about the main way to distinguish them, which is vernation. Vernation is the way the leaves are arranged when they emerge. 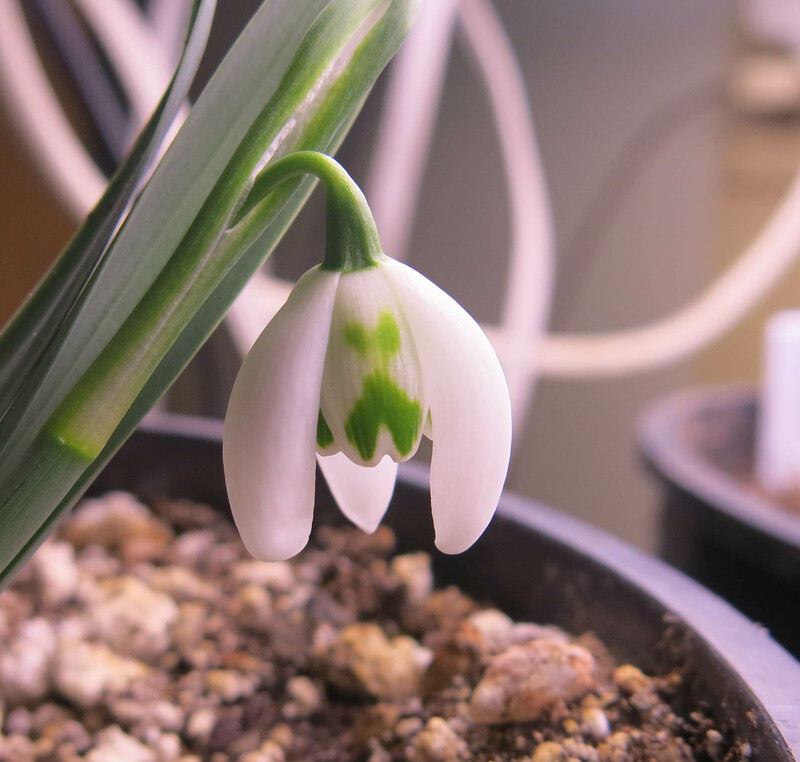 There are three ways to distinguish snowdrops. Then after that, there are what you might call subcategories to distinguish them, but these are the main ways. The first type of vernation is called applanate. You can see how the outer leaves are parallel. The second type is called supervolute. One leaf clasped within the other. The third type is called explicative. The outer edges of the leaves are rolled backwards. The species that has this is Galanthus plicatus, which the guy I live with says should really have been described as “G. explicatus”. Plicatus in Latin means “folded”. So there you have it. I hope you were able to stay awake during this lecture. I’m going to let you go now. I know this was yet another one of my non-linear posts, but I am a purebred border collie, and we do tend to become distracted occasionally. Do you remember what you did in the birdbath? 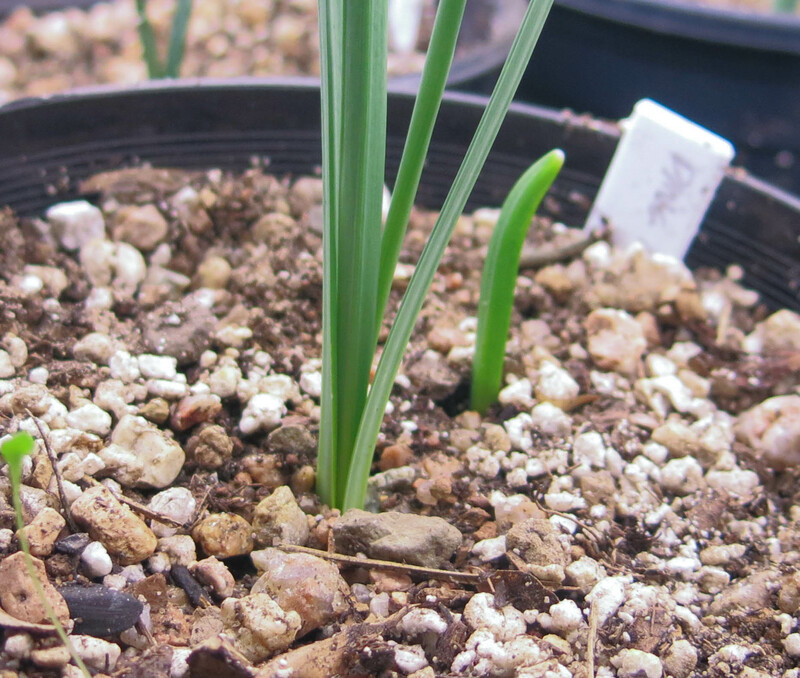 What do you think would happen if you did that to some of the snowdrops? Oh, then lets not do that. No, he never has. Might in a couple of years. Snow is beautiful… for the first day. We aren’t “supposed” to get it, but have been hit hard, for us, the past two years. So far this year is okay, too warm during the day though (60s). I worry the fruit trees etc. will break dormancy too early. That snow drop doesn’t look sad to me, it looks exactly like a lop bunny face! That tile photo brings back bad memories of how bad one of mine used to look. Isn’t it a shame how we start something simple and it turns into a federal case? I just needed a new recessed toilet paper holder, but after removing the broken one, see the stud is in the way (it had been hacked at already), so I have to cut dry wall and move the hole over. Home repairs must freak you out, being a sensitive pure bred Border collie and all. Make sure the guy you live with keeps his phone on him. The guy I live with worked in telephone repair and installation back in the 1980s, and it was like a rule that if he thought a job would take five minutes it took five hours instead. Long, long story with the faucet. The threads on the valve seat on the hot side were so worn he had to use marine epoxy to hold the new valve seat in place, and that lasted for several years, until finally it didn’t. So he called a plumber, who had to knock out tile to install a whole new faucet assembly. The lighter tiles are his tile work. The grout needs to be cleaned periodically, because the bathroom has no window. 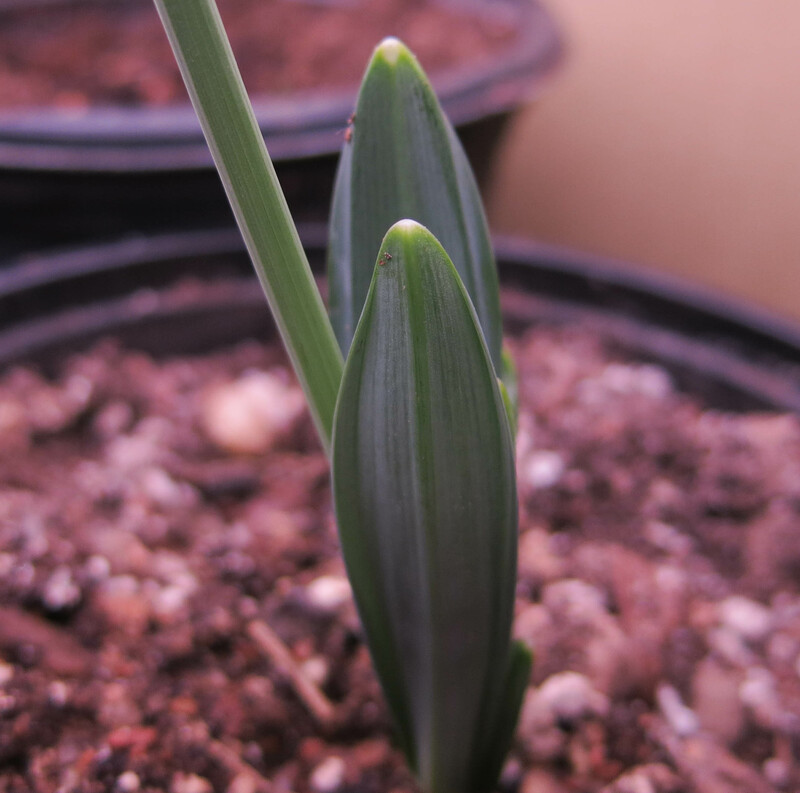 It used to be typical for buds to break early here, often very early. Roses and clematis would leaf out in January. The weather here has changed so much in the last quarter century that a lot of things that used to happen never do now. I gather acetic based silicone caulks are a no-no in the household. They will skin up in just a few high humidity minutes. Spritz-spritz. Well, this was the caulk sold by the local hardware store. Bathtub caulk. Wow, my library had that book and the one on Sissinghurst so I’m grateful to hear about them. And I also learned something about snowdrops. Most of my small circle won’t be impressed if I try to enlighten them, however. Say, TGYLW is pretty brave to publish photos of his bathroom. I wouldn’t have the courage as my c. 1954 home has a few defects. He’s brave to “walk” you in the snow also. The guy I live with says that if snow came in different colors it might be more interesting… The brightness, here, a mile above sea level, of sun on snow is very hard on his eyes. Being much more advanced, I’m fine with it. Emergencies like that can be a pain. We need a new roof, new driveway, and the patio needs to be mudjacked. (The part which was added later and had no expansion joints installed; it cracked into several pieces during the “awful winter” of ‘06-‘07 when there was a huge amount of snow.) I may have said all of that already. He’s a bit embarrassed by how the roof and driveway look. And he was going to paint the house this past October. But things got in the way. Hours and hours on the phone, working out things pertaining to his mom’s estate, and then trips to the doctor. It sometimes is nice to get yourself something. The guy I live with is very happy with his cane made out of Texas oak. He hasn’t had to threaten anything with it yet. Probably never will. 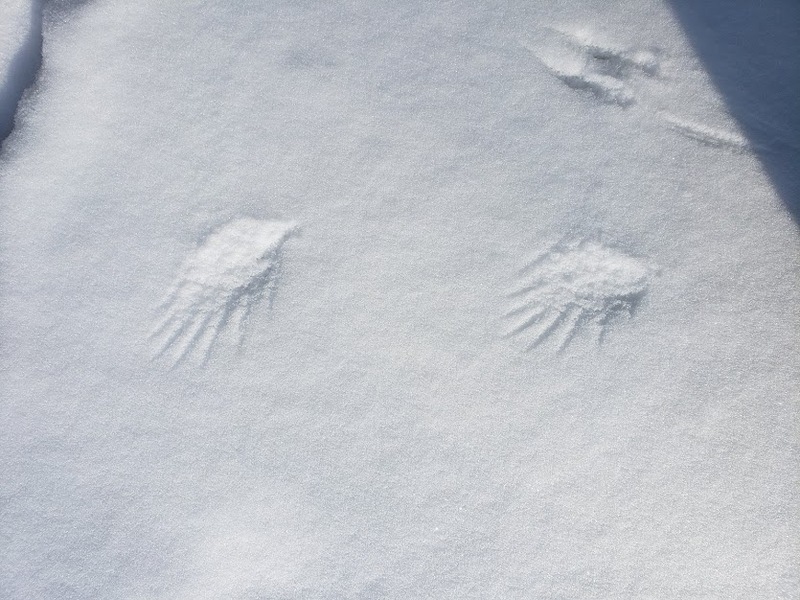 I saw those wing marks in the snow for the first time in Michigan a few winters ago – very beautiful, but I never managed to see a bird actually making one. Doves, maybe? Its good to be careful on slippery walks, especially since you seem to go in rather out of the way places! Could be doves. We have European collared doves here, which almost everyone is against. Without going into detail, I can testify that hawks are not against them. I rarely slip, but the guy I live with sometimes does. The new cane does come in handy then. The snow now, though, is mostly crusty, and noisy to walk on. If the guy you live with, Mani, wants to give a test on three kinds of snowdrops, betcha I can pass it now. A trouble with being a garden book collector is one loses track. I do know I have a book – or books – by Jane Brown looking much like that one, so I shall go search the shelves and then read whatever I find. 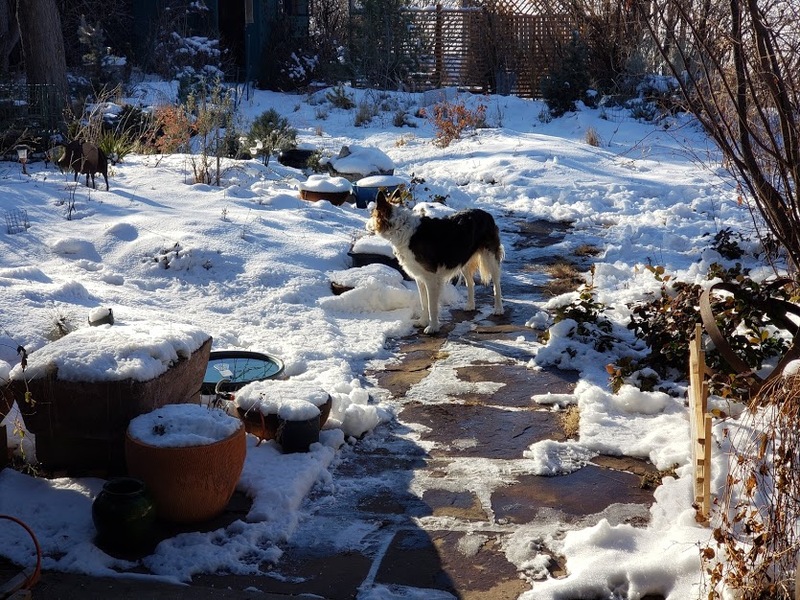 Pure bred border collies look excellent in the snow, and the snow scenes you show are magical. Tell the guy to be touched by the magic when he isn’t rocking back and forth or wrestling tile. Also, the bathroom may lack a window – ours does – but the space can acquire a fan. During times of snowy weather, life can be best spent poking about a book store. He and his friend made a good call. The guy I live with says “No charge for this service”, re identifying the three types of vernation in Galanthus. There are further ways to distinguish the species, which I may discuss at a later date. Chess, the purebred border collie who lived here before me, did a post, “A Golden Afternoon”, on another book by Jane Brown. The bathroom has a fan, which occasionally needs to be taken down and oiled. And then put back again, which is not the easiest thing in the world to do. I know because I can hear it being put back. There’s this like metal leaf thing with a hole in it that you have to put the bolt holding the fan cover through, and the leaf thing moves when you try to thread the bolt through it. “Golden Afternoons” is the book we have, I’ll look for the Vita book on our shelves. Photos in that post showed, uh, a different world. My heart is also broken anew. Characteristic poses of popular hosts are def healing. Thanks, and, yes, I agree. I hear that Chess was really spoiled. It’s kind of surprising that Vita spent less time at Sissinghurst than the guy I live with has in the garden here, but we have less to show for it, partly because of the icky climate, but mostly because a lot of stuff was ripped out ten years ago. Meow meow Mani you all know ’bout Red Green??? Hee iss so funny! An guess what? LadyMew met him Steve Smith an his wife Morag many yeerss ago bee-fore hee did Red Green…..hee an shee had another show on TV shee told mee. Beein a poochie has sum perkss fore sure! Yes, duct tape is excellent.